between 1917 and 1926 He was employed by Pierre Cartier and established the New York City branch in 1909, moving in 1917 to the current location of 653 Fifth Avenue, the Neo-Renaissance mansion of Morton Freeman Plant (son of railroad tycoon Henry B. Plant) and designed by architect C.P.H. Gilbert. Cartier acquired the mansion from the Plants in exchange for $100 in cash and a double-stranded natural pearl necklace valued at the time at $1 million. between 1917 and 1926 at Cartier, Inc., New York, New York. "JOSEPH P. HARTNETT. It is not alone in business lines that Joseph P. Hartnett has sustained important relations to the public, for in other fields of activity he has been equally energetic and determined, displaying a contagious enthusiasm that has contributed to the growth and success of various social, intellectual and moral movements with which he has been connected. 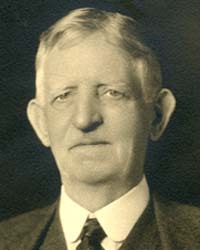 He is now well known as the secretary and director of the L. M. Rumsey Manufacturing Company, manufacturers and jobbers of plumbers, steam and railroad supplies, pumps, agricultural implements, machinery and various other products. He was born in Limerick, Ireland, August 4, 1861, but although the family has been represented in the Emerald isle for several centuries, it was established there by ancestors who came from France. His parents were Joseph F. and Anne (Gleeson) Hartnett, who emigrated to America in 1865, becoming residents of St. Louis. Here the father held various positions, to which he was called by reason of his ability and fitness. His death occurred in January, 1894. Joseph P. Hartnett attended the parochial schools of St. Michael, at that time in charge of the Christian Brothers, there pursuing his preliminary education until 1872, when he entered St. Patrick's Academy and was graduated as Master of Accounts in 1874. At that time he took up a college course in the Christian Brothers College, where he remained until 1878, when the degree of Bachelor of Arts was conferred upon him. Going to Council Bluffs, Iowa, he was a teacher in a parochial school there until 1879, after which he returned to St. Louis and entered the employ of the L. M. Rumsey Manufacturing Company as a clerk in the order department. He proved competent and faithful and was advanced from one position to another of larger responsibilities until 1893, when he was elected assistant secretary and a director. This was followed by his election as secretary, which is his present official connection with one of the largest and most important manufacturing enterprises of the city. He also represents the estate of Moses Rumsey, having been appointed executor thereof, a testimonial most suggestive, as Moses Rumsey in his will named Mr. Hartnett sole executor to serve without bond. While Mr. Hartnett has won notable success in business, his work in other directions is equally commendable and shows him to be a man of liberal spirit and broad humanitarianism. For seven years he was the supreme chief Sir Knight of the Order of the Knights of Father Mathew, and for two years was president of the Irish Catholic Parade Union. He was also president of the Irish-American Society and, a fact of which he has every reason to be proud, is that he is president of the Christian Brothers National Alumni Association. He was formerly president of the Christian Brothers Alumni Association, of St. Louis. The Christian Brothers Colleges have a national association, comprised of the different colleges and academies united and controlled by the Christian Brothers throughout the country. Of this association he was elected president in 1907 and was reelected national president for the years 1908- 1909. He has been very prominently identified with the export business of St. Louis and has served for three years as secretary of the Latin-American Export Club and its vice president for one year. He was also president of the De Soto Building Association for ten years and is a member of the Merchants Exchange. His religious faith is that of the Catholic Church, and he is a prominent member of the Blessed Sacrament church, serving on its executive committee, while he was also elected the first president of the organization. [S41] Letter from Chris O'Mahoney (Michael St., Limerick, Ireland) to Hilary Hartnett, 13 May 1992; Collection of Vincent W and Donna F Hartnett, issue on record at St. Johns Joseph (14-8-1859). [S17] 1880 U.S. Federal Census. age 20 in both Jun and NV. [S58] Gould's St. Louis Directory , p. 958, img. 483/1532. Joseph P Hartnett, sec Philipsburg Mining Co, 821 319 N 4th, res. 4902 Lotus. [S41] Letter, Chris O'Mahoney to Hilary Hartnett, 13 May 1992, "Issue of record in St. John's: ELLEN (29.7.1855), MARGARET (26.5.1857), JOSEPH (14.8.1859, MICHAEL (13.7.1861)." Margaret and Joseph emigrated with parents, Michael (in U.S.) may have been another Michael based on birth status (c. 1868 in MO). [S520] VWH, The 1880 census has Vincent age16, b. Ireland, Michael age 12, b. Missouri. That would place migration 1864–1868. The 1920 census for Joseph Patrick gives 1866 for entry, father's citizenship 1870. The 1925 census for Joseph Patrick gives age 63 [he was b. in 1859, so was actually 65 or 66], imm. age 2, or entry 1863–1864. An outlier is the 1900 census for Anna which gives entry to U.S. in 1872. [S1208] Christian Brothers College 1914–1915 Catalog (St. Louis: Sam'l F. Myerson Printing Co., 1914), p. 67. Joseph P. Hartnett, St. Louis, A. B., 1878, list of graduates. [S21] Albert Nelson Marquis, editor, The Book of St. Louisians, 2nd edition (Chicago: A. N. Marquis & Co., 1912). [S58] Gould's St. Louis , for 1883; p. 480; also Joseph F. P., foreman and Vincent, clerk; all res, 2703 N. 10th. [S5] 1900 U.S. Federal Census. June 7, SD 11, EnD 419, ward 28, sh 10-11, fam 231; Solomon (68), b. Ireland Apr 1832 , retired; Annie (64), b. Ireland Aug 1835, 10 children, 8 living; m. 26 yrs. [S8] 1910 U.S. Federal Census. Joseph P (48), b. and parents b. Ireland, merchant, 2nd marr., imm. 1865; Estelle R (27), b. and parents b. MO, 2 children, both living; marr. 4 yrs. [S2129] The St. Louis Star, St. Louis, Missouri. [S705] The Daily Argus, Mt. Vernon, N.Y.
[S624] Walter B. Stevens, St. Louis: The Fourth City: 1764--1911, 1909 edition, III:539-540.